Predictions of the demise of the SSP have once again been proven to be the wishful thinking of those who would like to see the end of Scotland's biggest and best socialist party. As well as standing on the regional list, the SSP is standing candidates in 31 of the 32 council seats across the Lothians (17 in Edinburgh, 6 in Midlothian and 8 of 9 in West Lothian). In West Lothian we've decided to stand aside in the Broxburn, Uphall & Winchburgh ward in favour of, former nurse, Ellen Glass of the "stop the downgrade of St John's campaign". I've also pasted below an article I wrote for the South Edinburgh Echo. The Scottish Socialist Party will be standing candidates in every Council seat in Edinburgh. Our candidates are all local activists. In Liberton / Gilmerton our candidate will be none other than our sitting MSP and party national convenor Colin Fox. Colin lives in the Inch and has two children at the local primary school. His partner Zillah is a midwife at the new Royal Infirmary. His candidacy shows our commitment to South Edinburgh one area which Colin has served these past four years at Holyrood. 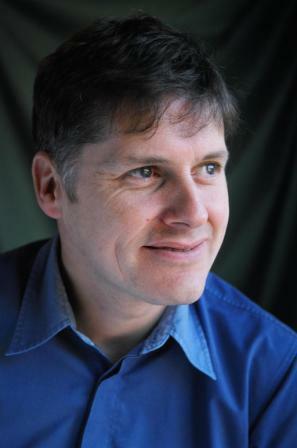 The SSP candidate in Southside /Newington is Scott Simpson who works as a community worker in Craigmillar. And in Meadows /Morningside we present Helga Janzen a payroll manager from Marchmont involved in a variety of local issues including campaigns for better public transport and protecting local shops. 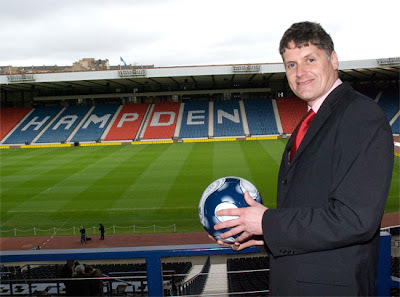 Colin Fox MSP will once again head the Scottish Socialist Party challenge in the Lothians. Colin is seeking re-election to Holyrood and is proud to put his record in fighting for the interests of working families this past four years in front of the electorate. He will be joined by a list of candidates, men and women from across the Lothians bringing a wide variety of skills and experiences together. ;and of course our defining policy is our support for an independent socialist Scotland. 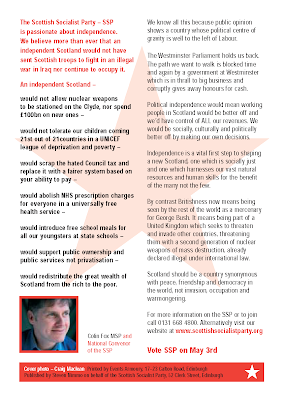 The Scottish Socialist Party rewrote the history books when they got 6 MSP’s elected in 2003. We believe we can again do so again. Over the past 4 years no one has worked harder for working people and the things they value the most than the SSP. 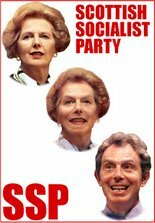 We have opposed the hideoauys and barbarous war in Iraq, we have argued for public ownership and public services against the incessant drive towards privatization of this executive. We have opposed the package of cuts in services at Scottish Parliament and Council level. Colin was for example at the forefront of the successful campaign to keep local schools in Edinburgh open and to keep a full array of health service in palce across the region. The SSP MSP’s have been the socialist conscience of the Parliament. In championing the rights of the most vulnerable and needy in our society Colin was elected as ‘a workers representative living on a workers wage’. He donates half his £55,000 salary to campaigns committed to improving the lives of ordinary people. He follows the wise advice of those founders of the socialist movement who advised those seeking to represent working people - ‘rise with your class not out of it’. The Scottish Socialist party list for Holyrood includes people from all over the region each with a wealth of experience and commitment to making the region much more equal and just and fair for ordinary people. Edinburgh is a very rich city and we want to see much more of the great wealth accumulated here going to those who need it the most; to children living below the poverty line, to pensioners struggling to get by on a daily basis on a meager pension, to the needy in a rich city. Yes we want to redistribute the wealth of the city from the rich to the poor. I've not had a chance to update my blog as regularly as I would have liked but here's some photos and updates on some of the stuff we've been up to. 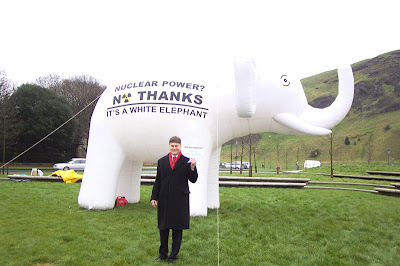 The picture above was taken for a Friends of the Earth photoshoot of MSPs opposed to nuclear power. 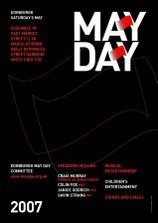 Scottish Socialist Party leader Colin Fox will tell a public meeting in Edinburgh tomorrow night that Scots would be ‘economically, socially, culturally and politically better off’ under Independence. Responding to polls which suggest a majority of voters want more powers devolved to the Scottish Parliament rather than outright independence, Mr Fox told us. ‘Ironically it is the powers that devolution denies people that they want the most. -the power to reverse the privatisation of our public services. -the power to redistribute the huge wealth of Scotland from the rich to the poor. These are the powers voters want but we of course we will simply not get them unless we are independent, that’s the rub! ‘I have no doubt that working people would be economically, socially, culturally and politically better off under Independence. PROCLAIMERS star Charlie Reid has dumped the SNP in protest at their links to big business. 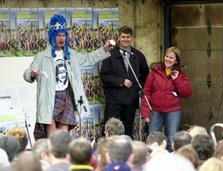 Charlie and twin Craig - at No 1 with Comic Relief single I'm Gonna Be (500 Miles) - were Alex Salmond's biggest celebrity backers after Sir Sean Connery. The defection to the SSP is a crushing blow for the Nats just a month before the Holyrood election on May 3. It will stun supporters and spark a new debate about the SNP's controversial funding from anti-gay campaigner and Stagecoach founder Brian Souter. Charlie, 45, said he had already given the SSP a donation but brother Craig will continue to support Alex Salmond's party. In an exclusive interview with the Sunday Mail, Charlie, who first shot to fame with Letter From America, said: "I'm changing my allegiance from the SNP to the SSP. "I still have a lot of respect for people like Alex Salmond, Kenny McAskill and Nicola Sturgeon and I think they will form the government after the election. "But I think they are placing too much emphasis on courting big business. "For that reason, I'll be voting for the SSP at the election. "I think it's important to have a party in the parliament with left wing principles prepared to stand up to big business." Charlie has already met SSP leader Colin Fox and sent a cheque to boost party coffers. The pair first met in February at a demo to campaign for better sports facilities for kids. Charlie and Craig are hugely popular figures in SNP circles but Salmond has spent a lot of time and effort wooing big business. He has received the backing of influential figures including former Royal Bank of Scotland chief Sir George Mathewson - and donations of £100,000 from Sir Tom Farmer and £500,000 from tycoon Souter. But he has been criticized for taking the money from from Souter, who led the campaign against the repeal of anti-gay law Clause 28. SSP leader Fox said: "I'm delighted Charlie has now chosen to give his public backing to us." An SNP spokesman pointed out that they had just enlisted the support of singer Sandi Thom. He added: "The SNP have growing support among Scotland's arts community, as we do across Scottish society." On saturday morning I met our council candidates for Midlothian at Newtongrange Mining Museum for a photo then we were off to Penicuik to campaign against Trident. The candidates in the photo above are (l-r): Neil Bennet (Bonnyrigg), Lynn Leitch (Midlothian West), Norman Gilfillan (Penicuik), John Carroll (Midlothian South). I was invited to Meadowbank stadium last Saturday to address a public meeting organised by campaigners opposed to Council plans to demolish the stadium and build private housing on the site. Can I first of all say that I have my own very special reasons for keeping this place open. This is the place where I made my hurdling debut in May 2003 on the night I was elected as an MSP for the Lothians for the SSP. It was a night /morning I will never forget and this stadium will always have a warm place in my heart. And you know I suspect it has a warm place in all 600 of you too and that’s why you are here and feel so passionate about this issue. But you know I am no dinosaur, I don’t want to see this place stay as it is, I want to see it improved, I want to see investment in this and indeed all this cities sports and leisure facilities. I notice that ‘Save Meadowbank Campaign’ has put a leaflet on your seat asking you to get politicians to answer three specific questions. Well let me answer these three questions here and now. No, I don’t support the demolition of Meadowbank and it used for private housing development. Yes I do support the widest possible public consultation on the Councils proposals. And let me go further. I am sick to the back teeth of Councils, Health Boards and others engaging in apparent ‘public consultations’ only to watch them disregard our views completely and do at the end exactly what they intended to do at the beginning. That is a sham, that is not genuine democracy. The Council, and leader Donald Anderson [who had spoken earlier in the meeting and said that ‘The money just does not exist to refurbish Meadowbank] is forever putting out glossy brochures telling us how successful this city is and how rich it is. But he cannot have it both ways, now telling us today that the money is not there. This is a rich city. Some are having boom times with record profits, labour shortages and soaring house prices. As a socialist I want to see that wealth shared out more evenly, taking from the rich and giving to the poor. And you do not achieve that by closing vital public facilities like this one and building luxury private properties for the few. Last Friday I had the pleasure of attending the opening of the first Council house in Scotland for 30 years out at Woodburn in Dalkeith. I grew up in a Council house in Motherwell. Council houses are a great idea, but you would have to be over 30 to remember what they were. It would be one thing if the Council were coming along here today saying they intended to redevelop Meadowbank and provide 21st century facilities on one part of the site and new Council properties for the people of East Edinburgh on the rest but they are not. Their plan means the loss of precious open space in the East of the city and 90% loss of leisure facilities. I will not support that and you will not support that. I understand that the Council has extended the deadline for consultations on their plan until 31st March and that no decision will now be taken before the election. I hope everyone here realizes that this represents a climbdown from their original timetable and that must be see as a victory for your campaigning. This makes this a huge election issue in the elections and you must decide who you trust to protect this centre when they are on the Council. I want to see money being spent here on this vital local facility. I want Meadowbank stadium to stay open and I want the new facility at Sighthill too. I simply will not accept that. There is money for Meadowbank, there is money for Council housing, there is money for free school meals and free public transport, for our pensioners, for our youngsters……there is £100billion pounds available by not building more nuclear weapons of mass destruction. Independance on the never never? SSP National Convenor Colin Fox MSP has written to SNP leader Alex Salmond following comments attributed to SNP financier Sir Tom Farmer, that the nationalists intend to water down their commitment to a referendum on independence in order to placate possible Holyrood coalition partners the Lib Dems. Colin was responding to Sunday newspapers reports that Salmond intends to put the independence referendum on hold for many years if he becomes First Minister after May's elections. 'If these reports are true and Alex Salmond intends to concede arguments to the Lib Dems and big business then independence supporters across the country will be having a 'Kwik-Fit'! the SNP leadership has postponed again and again its plans for an independence referendum and now it is relegated still further. 'Colin said: "In dancing to the tune of the business community like this, always the most luke warm supporters of independence - just as they were with devolution - Alex Salmond risks losing the support of the most passionate advocates of self determination." "The SSP are clear that an independence referendum is an early priority after May and our MSP s will introduce just such a Bill to bring it about." "Whilst the SNP are wavering, looking for coalition partners and relegating independence to the third division, voters will certainly recognise that it is the Scottish Socialist Party who are this country's firmest supporters of independence and I urge them to use their list votes accordingly." "A strong group of SSP members in the next parliament can play a critical role in making sure that independence isn't kicked into the long grass." 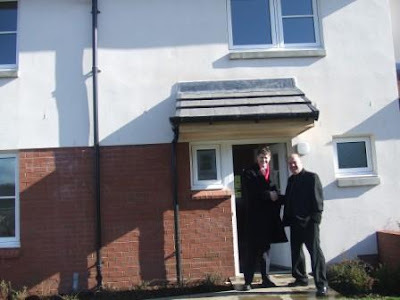 I'm pictured here with Midlothian Councillor Derek Milligan the Housing Convenor, outside the first Council house built in Scotland in 25 years at 1 Bill Russell Grove, Woodburn, Dalkeith today. The house is the first of 1,000 new Council houses to built in Midlothian. This terrific initiative is one which I have welcomed from the start and the Council were grateful to acknowledge my support. I was taken round the house by the new tenants and it is a lovely big four bedroomed property which the council built at a cost of £80,000 but which local estate agents have said would sell at £180,000. I have warmly welcomed Midlothian Councils £105m investment. I don’t see why Edinburgh City Council for example which is far richer cannot do something similar for tenants in the city. Moves are afoot inside Edinburgh city Council to axe 200 full time nursery places across the city. Last Thursday I asked, current Council leader, Ewan Aitken – who was previously the Education convenor and head of the Children & Families department – to assure me he has no plans to cut these essential services. He responded 2 days ago by saying he would reply with urgency! The council, in the January ‘07 edition of Working Capital, highlight a recent study by Women onto Work which shows that 65% of women in Edinburgh see childcare as the number one barrier to getting into work. Losing 200 nursery places will have a devastating effect on women and their families in the city. Nursery nurses in Edinburgh fought a long, hard strike a few years back for decent pay and conditions, and this is how they are repaid, by making their jobs redundant, moving them on to posts they don’t want and losing their skills in the process. S2W-32239 - Colin Fox (Lothians) (SSP) (Date Lodged 6 March 2007) : To ask the Scottish Executive whether there are any plans to reduce the number of full-time nursery places available for three and four-year-olds in south and south-east Edinburgh. S2W-32238 - Colin Fox (Lothians) (SSP) (Date Lodged 6 March 2007) : To ask the Scottish Executive what the public sector provision is of full-time and part-time nursery places for three and four-year-olds in south Edinburgh. I am the Scottish Socialist Party Member of the Scottish Parliament for Lothian region. I am also National Convenor of the SSP. I live in the Inch on the south side of Edinburgh with my partner Zillah and our two young children. 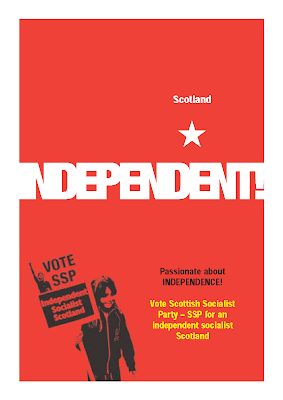 A founder member of the SSP I have been an active socialist combatant for 25 years now. posła do Parlamentu Szkockiego, każdy piątek 14.00-16.00, 52 Clerk Street. Edynburg. Thanks to Alister Black, Craig McLean, Eddie Truman & Collette Mengiles for technical advice, photos and video footage.